SPECTREOUTREACH.com: Creativity :Good or Evil Purpose? Creativity :Good or Evil Purpose? When latest fashion fad is fused with top leading soft drink manufacturer(IT and Vending industry) under the brand of girlswalker.com. The result is kinda interesting and very surprising that even I kinda tempted personally to enter my precious coin into this vending machine to get a taste of the magical drink. 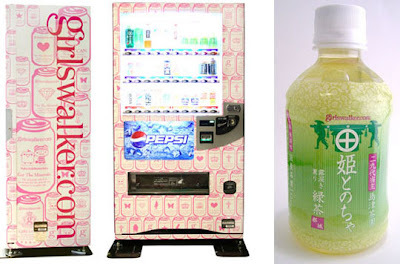 According to the statement I got from Nilain-nakamura.com, "The vending machines will carry mineral water, ice teas (and other girl and young women-friendly products) plus original products created in collaboration with popular fashion brands or in honor of girlswalker.com promotional campaigns. With this move, Branding hopes not only to raise their presence but also to build on their thus far successful framework of communication and retail cross business enterprise". Hmmmm. cashing the cash by targeting the female group by offering product that appeal to them. Now, that is a wise move for-moolah. However, It's only going to be available at Japan (numbering around 3,000 plus) and I doubt we will seeing this kinda of vending machine in Bolehland any soon. Sigh! A Victory thumb up from me! Next, one of the topic under the LaMB Animax-Asia contest requires me weather I support lamination? The answer is simple. No. Again I rephrase it. NO! Why? Simple enough.It's very degrading, sick and mockery to any government, law enforcement agency or any sensible human being to implement this kind of sentence plus it clearly a gross violation every human right treaty that existed in the United Nation charter for that matter. It's one thing to seek profit by using our creativity but to be turn into a method to humiliate or subjugate other fellow human being as method of punishment is big no-no at least to me personally. So,what do you guys personally think about this kind of punishment?